Preparing for triathlon training and race day does involve a lot of research. Especially if you’re completely new to this type of physical and mental endurance, it can seem a bit overwhelming. And that is precisely what it should be. You don’t want to go into this with a frivolous attitude. It’s one of the toughest races you can imagine. Even for extremely fit and experienced athletes. Many break down during training. And lots of people fail in a race. While there are many reasons for this, you don’t want your equipment and clothing to be at fault. That’s why we’ve put together this review to help you get the best triathlon shorts so that you don’t end up in a situation where you just want to rip them off. On this page, you’ll find the best products available without having to go for custom fitting. There is something for every budget and experience level. Whether you’re heading for tougher Ironman races, or you’re just trying to the right thing for your first attempt. You’ll find something that will work for you. We also have a section further down on what the most important features are and how you can best go about getting your wearable gear ready for a race. Just keep reading and pick an option that suits your experience and budget. If you’re not too concerned about spending a bit extra, then this SLS3 product is the absolute best option for you. These German designed and made shorts are ideal for tri athletes of all levels. Even if you’re just planning your first race. Through extensive research and development, and work with actual athletes, the company has come up with a unique padding design. This ensures that there is no chaffing during the cycle or run phase. Unless you have experienced this before, you won’t understand what it’s like. Definitely, something you want to avoid. The waistband is elastic, which gives a snug fit. But to make sure that the shorts won’t slip or twist, there is also a drawstring to tighten them a bit more. Obviously, you’ll need some energy during a race. With two side pockets, you have enough space to bring some much needed energy gels and snacks. The material is also long enough to cover a large part of your upper leg muscles. With a slight compression effect, this will help reduce muscle fatigue, giving you a better performance. The only real downsides are that the legs can be a bit loose fitting for slim legs. And there really is no color or design option to help match them up with your other gear. Many tri beginners don’t think too much about getting the best possible fitting shorts. But the only way to really achieve that is to get a gender specific product. Male and female body shapes are very different, especially around the hips and thighs. This Canari model has been specifically designed to make sure it molds perfectly to the female shape. And what’s really great is that you can wear them for the swin, cycle and run, without having to change. Even if they get wet during the swim stage, they will dry in no time once you get on the bicycle. The leg grippers at the ends are very soft and work well to keep them in place. The only thing to note is that if you have built up quite a bit of leg muscle then it can feel a bit tight. The lightweight material has great ventilation to help you stay cool and dry. And with flat seams you won’t feel pressure points or chaffing. Overall it’s a very comfortable option for beginners and intermediates. 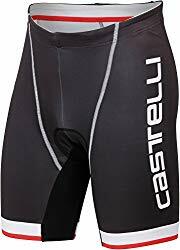 Castelli is one of the leading brands in all things running and cycling, so it’s no surprise that they have designated tri shorts. Because of the stretchable material, you get a very tight fit that helps to support and protect the muscles. This in turn helps to reduce early muscle fatigue, which is great for training and race day. If you also invest in the company’s tri tops then you can use the integrated hooks to holds the two together. This works much better than depending on being able to tuck in a shirt. This usually just ends up slipping out. The rei a comfortable seat padding that you won’t even notice is there during the swim or running stage. If you’re used to wearing these types of shorts, then be aware that the padding is thicker than on most other products. Might just take a bit of getting used to. There is a large rear pocket that you can use to store some snacks and energy gels. The rear position makes it easier to access, especially during the cycle. The sizing is a bit on the small size, so if you’re between sizes on the chart then go for a larger one. You won’t have to worry about the waist, as it has a draw string as well to tighten more if needed. This is an excellent product, made in the USA, with one great stand out feature. The entire shorts are made of just 2 material panels. That reduces the amount of stitching necessary to a minimum. The less stitching there is the less likely you are to get a pressure or friction point. And the few seams that are there, are designed to be flat so that they don’t end up rubbing your skin. You’ll also be pleased to know that the material is quick drying. That means that as you get out of the water you won’t have to worry about the wet shorts. Within a few minutes of cycling, they will have dried out. The drawstring around the waist is important as it allows you to fit them as tight as you need them to be. This is especially the case if you’re on the border between two sizes. And for the fashion conscious athletes out there you can choose between several nice options. The downsides are that you don’t get a pocket to store some snacks and the seat pad is not removable. Some athletes prefer to be able to take it out altogether for the running stage. For excellent value for money, women won’t go wrong with these Luis Garneau shorts. The fabric is exceptionally soft which just makes for a much more comfortable training or race day. And with the design specifically taking the female body shape into account these will feel like they are made for you. The stretch material will also act as compression shorts. This helps to increase blood circulation and decrease muscle vibrations. The result is much better performance and less muscle fatigue at early stages. Despite being made of 12 panels, you won’t even feel the seams. The flat design is very well made and it will seem as if it’s all one piece. For races of all lengths, that is a huge bonus. By fitting so well and “seamlessly” you will also notice that they don’t twist or run up at all. There is also a rear pocket that you can easily reach while running or biking. It’s ideal for storing some energy snacks to help keep up your performance. The main downsides are that the material is quite thin and the padding could be a bit thicker. When you need something reliable that will go the full distance of your next tri race, then comfort has to be top of your list. That’s a difficult task when you go through the different stages of a race without getting changed. This Synergy product is ideal and priced very affordably. The gel based pad provides excellent comfort during the cycle and doesn’t cause any issues during the run. It might take a bit of getting used to for the swim though. The material is a compression type which keeps your muscles in place, increases circulation and reduces vibrations. All these things help you to perform better and reduces the risk of early fatigue. Not something you can afford during a race. The flat stitching ensures that you don’t feel any pressure points. When you wear them, they really do feel like they are made of one piece of material. You won’t have to worry about any friction and sore points, which can become very distracting to say the least. Before you order them, you should be aware that the fitting is a bit on the small size. And because of the compression feature they will feel very tight. That is by design though and will help you once you get used to it. If you need something to protect your legs and upper body but don’t want to wear two pieces of clothing then this Kona option is ideal. It is one piece and that has the advantage of the top not sliding up and exposing your skin. With 50+ UV protection you’ll also have less of your body to worry about putting sun screen on if you’re training or racing on a sunny day. This might sound trivial, but believe me, you don’t want to get sun burn on race day. It can make for pure misery. There is also a rear pocket that you can use to store some snacks and other refreshments. It will fit a few energy gel packs easily, but it would have been better if there was a second pocket. The material is fast drying, which is something you definitely want on race day. When you get out of the water you don’t want to be wet for a long time on your bike. This would become a bit uncomfortable as you can quickly go through different levels of body temperature. The pad is very comfortable for the cycle, and doesn’t get in the way for swimming and running. For long cycle races, it might not be thick enough though. You also need to be aware that the sizing runs quite small, so go at least one size up when you order. Female athletes looking for a more professional grade pair of shorts should seriously consider this SLS3 product. Designed and made by a leading maker of all types of tri gear you will get exceptional comfort. This is thanks to the design being tailored to the female anatomy, so you won’t feel pressure points. The waist is elasticated and to get the perfect tightness you can adjust it with a drawstring as well. That way you can make sure that it won’t slip during the stages of the race. The thin cycling pad is ideal for tri length distances. But if you plan to go on longer cycles then you might need to look at a thicker option. It’s certainly thin enough to not become a hindrance in the swim and running stage. The material is very flexible and stretches in all directions. This makes sure that it better molds to your body shape and you get a much more comfortable fit that way. To stop the shorts from running up and sliding there are leg grippers as well. These are comfortable and barely noticeable. On the downside, the padding can feel a bit strange when it’s wet and the sizing is a bit difficult to get right. If you’re between sizes, then aim for the larger one. Another great full body trisuit is this RunBreeze option. As a one-piece design, you won’t have to worry about your top sliding up and your shorts slipping out of place. It’s all designed to keep everything in place and provide excellent comfort. To protect you from harmful UV rays it provides for full sun protection. That way you will only have to apply sunscreen to your exposed body parts. Just make sure you don’t forget to apply it on very sunny days. It’s also ideally suited for cooler race conditions that don’t really require a wetsuit. In many summer races that is the case, and you’ll have a lot more comfort with this suit. Plus, you won’t have to battle to get out of wet suit and waste valuable time. To avoid any friction around the neck area from swim strokes, you’ll be glad for the wide neck opening. And with two pockets at the back you’ll have easy access to energy gels and snacks in all stages of the race. A recent product that has become popular with beginners is this Sparx one. However, it’s not a product that we would highly recommend for a few reasons. On the positive side, it works very well as a compression material. This gives you a lot better circulation and reduces muscle vibration. There are a lot of colors to choose from to match it up with your other gear. For the fashion conscious athlete that will be a big bonus. There are also pockets that allow you fast and easy access to snacks. On the downside, the pockets don’t seal with a zip or overlap. For serious athletes that will cause drag in the water. It also feels strange during the swim stage. Also, the thigh grippers don’t work as well as they should. This can quickly result in them sliding up and becoming a bit uncomfortable. If you do order them make sure to go at least a size up, as they run very small. For this price, they are not bad. But you will find much better ones above. Comparing products from different manufacturers is always a challenge. The main problem is that different companies often use different marketing terms to describe exactly the same feature. So, how do you know which one has better features in that situation? The best thing to do is to pick the most important features you can think of and then just focus on those. Ignore the marketing terms and just look at the features you really need. To help with this we’ve put together a list of things that a lot of performance athletes rely on. With these in mind you’ll have a much better chance of getting what you need. This is how we approached all the reviews above. We ignored the hype and looked at actual specs that athletes are interested in. The main topic of this article is obviously shorts. For triathlons that requires some specific things you wouldn’t see in any other shorts. But you will also need a top. And while you can get great separate tri tops, it’s sometimes a better idea to get a full body all in one suit. The advantage of these is that they keep everything in place much better. Your top won’t slip up and expose parts of your body to sun, wind and rain. And your shorts won’t slip down, because they are help in place by the top. It’s kind of a win-win situation. Some people though prefer the two separate pieces as it gives them the option to put on a dry top when they get out of the water. It really is a personal preference. If you’re heading for your first race, then we’d recommend not going with a full body option. Start with separate ones, and see how that works for you first. This is also a very important factor. No matter what the exact name of the material is, you want to make sure that it has a few properties. First of all, it will be directly on your skin so you need to make sure that it’s soft and comfortable. It also needs to be tight fitting, otherwise you’ll quickly get friction points that can cause chaffing and even blisters. It also has to be fast drying and breathable. When you get out of the water you’re going to be soaking wet. Getting onto your bike you want to know that it will dry off quickly. This helps your body to maintain a level temperature from start to finish. And you’re going to be sweating a lot. So, the shorts have to be designed to provide lots of ventilation without making you feel cold. The ventilation helps to cool down your body and that reduces the amount of sweating. Staying hydrated will be so much easier and you’ll have a much more comfortable race. Men and women have very different body shapes, especially around the hips and thighs. A pair of shorts that are comfortable for a woman, will be lose in certain areas for a man. And the same vice versa. If you’re serious about your training and racing then make sure you get a product that is specifically designed for your gender. It will pay off hugely and you don’t have to rely on stretch-ability to get something that fits you right. Just take the guess work out of it altogether. The padding in the shorts is very important. If you’ve had padded shorts before then just be aware that there is a difference between regular cycling and triathlon ones. Regular ones will have a lot more padding that is actually quite uncomfortable to wear. They are designed for long races. The triathlon ones are a lot thinner but not too thin to be pointless. The shape is also going to be quite different. They will be shaped in a way that doesn’t make them uncomfortable during the run and swim part. Some work better than others, and some even use some high-tech gels. These provide padding on the bike, but it reshapes to get out of the way in the water and while running. It’s an ideal solution, but will cost you a bit extra. One feature I personally like to look for is compression. You don’t need full on compression shorts, but a good bit of tightness can work wonders for your performance. The advantage comes in several ways. Firstly, the tight fitting will improve your blood circulation. This means that your body becomes better at bringing oxygen to the muscles. And that means you don’t have to work as hard. On race day that can shave off a load of time and get you to your goals quicker. The next huge benefit is that you’ll feel a lot less vibrations in your leg muscles. These would be common during the running stage, but also while biking. The vibrations cause your muscles to underperform and compensate. The result is that you will encounter fatigue a lot earlier. The tight-fitting compression material will reduce that vibration a lot. And that means you can go a lot further or at a higher pace without fatigue kicking in too early. Some athletes are suspicious about this, but I have personally found it to work very well. I would certainly suggest trying it out and seeing for yourself. Yes, of course it has to be comfortable. Race day is long and you don’t want to feel pressure points or friction from any clothing. What we are looking at here is the comfort level you get throughout the race. The idea being that you put on one piece of clothing at the start and finish your race with it. The less changing you need to do the better your times will be. For competitive amateurs and professionals that is a very important factor. So, when you look at different shorts, make sure you look whether the design is specifically made to give you comfort for the swim and run as well. Because there will be padding in the shorts, this can be something that can quickly rub your inner thighs. A bad design will very quickly start rubbing and in extreme cases cause painful blisters. You’ll encounter enough pains during the race to not add to that. If you’ve completed a tri race then you understand how much organizing goes into it. But if it’s your first event then make sure you get some advice from other athletes that have been there before. The important thing to remember is that getting race ready involves a lot more than building up the fitness levels. What you’re going to wear on race day is a very important thing to get right. It involves getting the right running shoes that you have worn before. As well as cycling shoes that you’re used to. But most people will overlook their shorts and top as just something they’ll pick up. The risk of doing this is that you end up with something that seems to fit well, but once you’re wearing for many hours you’ll notice pressure points and friction. You’ll be going through stages of being wet out of the water and drenched in sweat. So, you cannot afford for your clothing to let you down in this way. And here is another tip. If you find something that really fits well and gives you the comfort levels you want, then buy some additional ones as backup. There is no need to go through the process of finding the most suitable clothing items on a regular basis. At this stage, you really have all the information you could possibly need to find the best tri shorts. You have more than enough choices for all budgets and with any choice you make you will improve your training and race performance. Don’t make the mistake of just getting a pair of cycling shorts. They will become uncomfortable in the running stage and you’ll just want to take them off. Get your pair today by checking out the Amazon links above under each of the tri short reviews. You’ll have your shorts in time for your next big training day.